John Jacob “Jack” Cody (Gaines) is a 20-year-old “box boy”, i.e., he works in a factory. He’s obsessed with Martial Arts, and even has a Rapid Fire (1992) poster on the wall at his job. He’s particularly enamored of a televised event known as Superfights. Following a childhood encounter with a Superfighter, it’s Jack’s dream to follow in his footsteps. One night, he saves Sally Wong (Yu) from a gang of thugs assaulting her at an ATM. When the head of Superfights, Robert Sawyer (Vitali) sees Jack on the news, he recruits him. Sure, Jack has to sign a contract so thick, it looks like the printed-out version of the Apple terms and conditions, but he signs anyway, because it all seems like a dream come true. He meets the fighters Dark Cloud (Jeffreys) and Budokai (Lenderman), and begins training under Angel (Gallant). When a “surprise ninja” confronts Jack, he realizes something shady and wrong is going on behind the scenes at Superfights. Could it be the enforced drug use? Or the fact that Sawyer stages underground Punchfights to the death in his spare time? Could it be a protection racket - or something else? Meanwhile, Jack also begins training with Sally’s wise old Grandfather (Lung-Kong). Will Jack live his dream - or will he find out it’s a nightmare? If it’s one thing that Superfighters - and Brandon Gaines - has, it’s energy. He’s so enthusiastic, he makes Tom Cruise look like Steven Wright. He also has some killer moves. Superfights is what the world needs now - it’s cool, happy, exciting, fun, wildly upbeat, and the enthusiasm is downright infectious. So many movies today are dour, depressing, cynical, and negative. Superfights is the antidote to all that. There’s seemingly a very well-choreographed fight scene every 30 seconds, and you grow to love Jack, Sally, and Grandfather. Brandon Gaines should, at the very least, have had the career that Loren Avedon had. Criminally - Criminally! - this is his only movie role. The world needs his earnest eagerness more than ever before. Where are you, Brandon? Please come back! Before Jack becomes his Superfights character “The All-American Hero”, his old co-worker calls him “Jean-Claude Van Dunce”. Would that Van Damme display Gaines’s level of intensity! 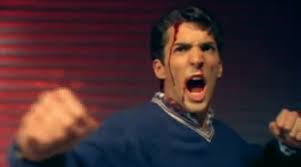 Chuck Jeffreys is his normal charismatic self, but it’s hard to compete with Gaines as the plucky hero and Vitali as the super-evil, Vince McMahon-like baddie. He insists all the fighters in his stable take Superfights “vitamins”. Gallant as Angel was an interesting casting choice - she looks like a buffer Arianna Huffington. Or, if you will, Arianna Buffington. There’s a great title song (with hilariously literal lyrics) that plays THREE times, there are TWO freeze frames, multiple montages, Jack never is, or becomes, a jerk, and there is a truly awesome final warehouse fight. 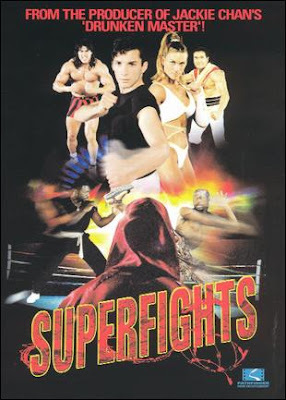 Superfights thoroughly delivers the goods and is impeccably entertaining the entire time. We’re impressed. Anyone who dislikes Superfights truly has a heart of stone, and has given up on life, and we feel sorry for you. Superfights is superfun. Also check out write-ups from our buddies, Cool Target and Fist Of B-List! It always makes me sit up when you give a review four stars. Because I had never heard of the movie, let alone watched it, I YouTubed its trailer. You are right. This is worth every word of praise. Nice review, as always. I do have to ask, though: Do you remember the episode of Friends when Joey and Chandler watch the adult channel enough to start believing real life works like that? Do you get upset that you don't encounter punchfights every day on your way to and from work? Heckyeah, Superfights! Love this one, great pick, guys. Have to agree with you on the fact that culture has been trending gritty-edgy-doom-dark-antiheroic-and-cynically detached for so long a time that it now borders on self-parody (True Detective, anyone?) (Actually, no, no thank you). This flick and others you've featured like Mismatched Couples, Action U.S.A. and Sakura Killers are a soothing balm, many thanks for finding and sharing them! Joe: It is disappointing that there aren't more daily punchfights throughout the work day. We don't watch Friends because there's no enough punchfighting. Haha. Anonymous: Thanks for noticing that we try to find the upbeat side of action. Just more reason to love the 80s and 90s. Thanks for the kind words.